A big thanks to these volunteers – l. to r. Fred Kanter, Wayne Head, Barbara Pudlo, Chairman Mike Pudlo, Chairman Tom Ronayne, Cole Nagler (high school student who gets high school service hours), Jane Logan, Lynette Nagler, Tim Logan and Mike Goodson. Not pictured is Juan Chapa. And thanks to Deputy Constable Lindsey Mariam who slowed traffic in trash collection area. Friends of the River San Bernard volunteers gather round the mound of highway litter collected on Sat Jan 21. 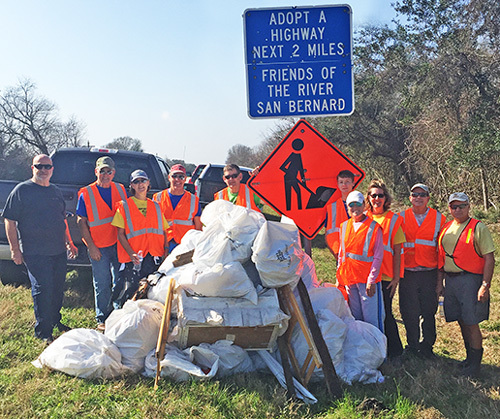 This is in partnership with TxDOT’s Adopt-a-Highway program to pick up trash along a two-mile stretch of FM 2611 before and after the Churchill Bridge. It was less than three months ago that an equal amount of trash was picked up along this section of road. Notice the piece of furniture in the middle of the pile – it’s a baby’s bassinet. There’s an old saying about tossing the baby out with the bathwater, luckily this was a bassinet or who knows what would have been found! Volunteer participation sends a clear message that their efforts really do make a big difference in keeping the San Bernard looking beautiful!